WordPress itself is free and open source, while the premium WordPress conference and event themes below are all very reasonably priced. They have been specifically designed for event organizers and include advanced event management features and functionality so you can get a professional and functional site up quickly and easily. All the themes have responsive designs ensuring your website is mobile friendly and accessible on smart phones, tablets and all other mobile devices. Attitude is a multipurpose WordPress theme suitable for business and corporate websites, project websites, conference and event sites, agencies, non profit organizations or anything else. The premium theme from WPLook Studio comes with lots of handy functionality and is easy to customize with the integrated Visual Composer page builder and advanced theme options. OpenEvent is a fantastic event WordPress theme that is modern, flexible, and powerful with all the features and functionality you need for a professional event website. The premium theme from ShowThemes makes setting up your website, managing your event and selling tickets easy. It has a powerful front-end editor so you can easily change the look and design to meet your needs. It has one click Facebook and Eventbright import, powerful schedule builder to show sessions and details, advanced event management, social media integration, countdown timer, ticket sales functionality integration with EventEspresso and Gravity Forms, Eventbrite, etouches, Tickera, Tickettailor, Xing Events and more to sell tickets for your events. The BigEvent WordPress theme is a modern and highly customizable theme for all types of events, conference, meet-up, musical concert, workshops, summit, festival etc. The premium theme is a complete solution for managing venues, schedule, speakers, sponsors, mapping, member registration, tickets and everything else necessary to run a successful event. It comes with 22+ homepage layout variations, 4+ one page website layout options, event management, event calendar, event schedule, speakers list, WooCommerce support and much more. 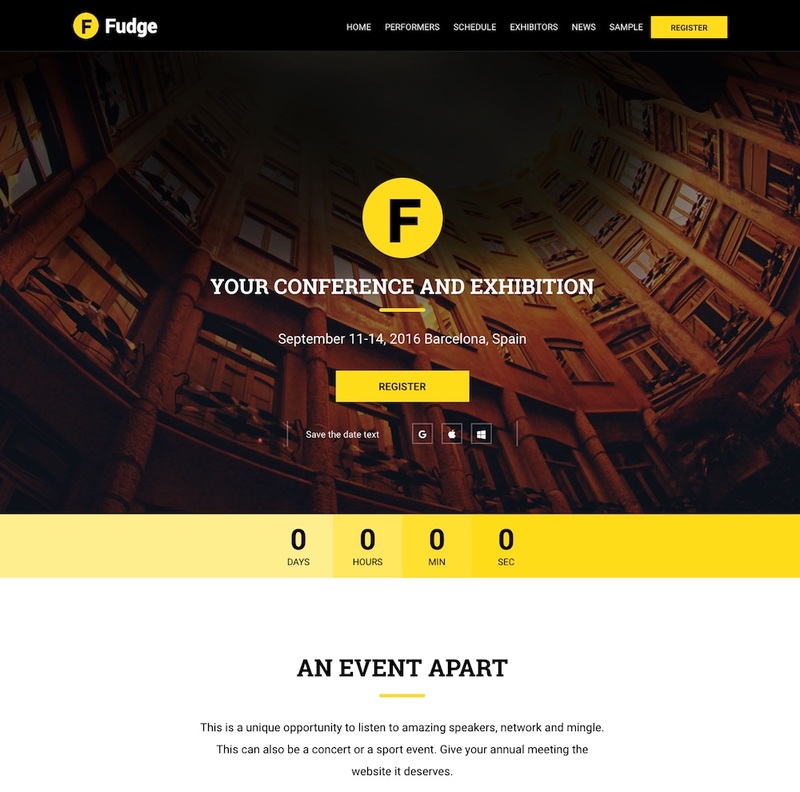 Fudge 2.0 is a beautiful WordPress theme for conferences and events. The premium theme from Showthemes has a modern and flexible design that can easily be customized for any event. It has advanced event management functionality to easily showcase your event, speakers, schedule, sponsors etc. and sell tickets. 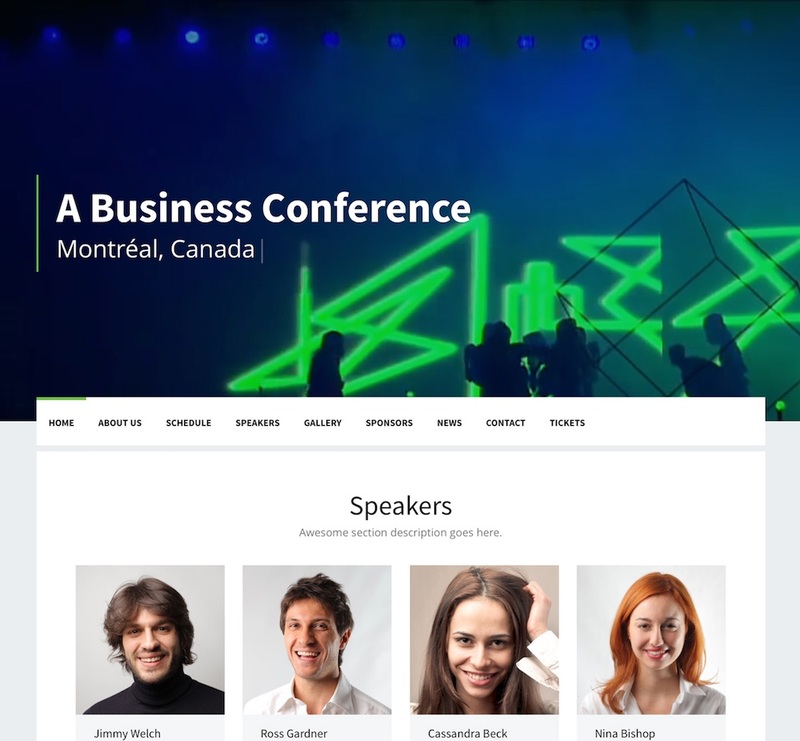 Conference is modern, clean and fully responsive WordPress theme designed for conference, concert, event, meetings, exhibition, and congress websites. 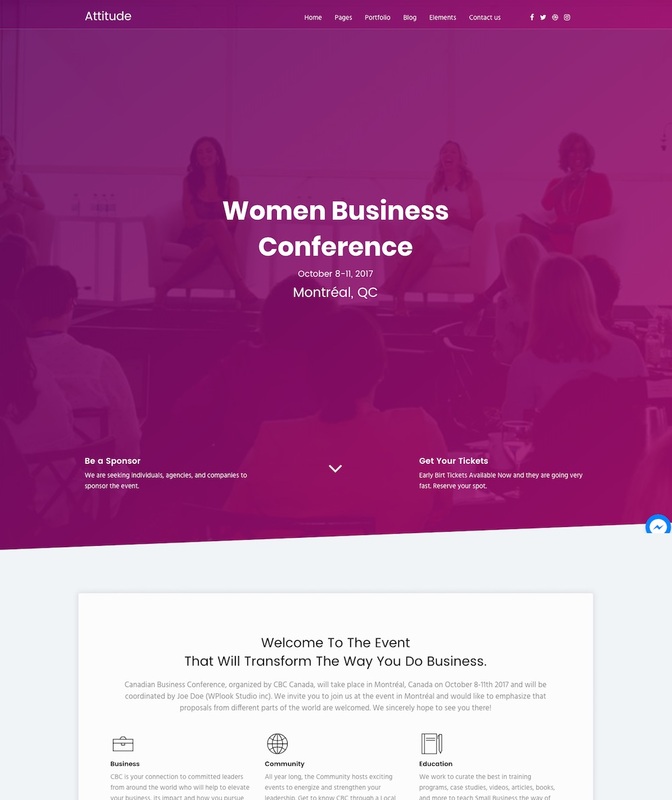 The premium theme from WPLOOK has an attractive and professional design, is mobile friendly and includes all the features you need in a conference or event website. It includes functionality and sections for schedule, speakers, staff, daily agenda, mailing list, sponsors, buy tickets, testimonials, photo galleries, blogs posts and more. ConferPress is a multipurpose conference, event and ticketing WordPress theme. The premium theme is perfect for all types of events, selling tickets, courses, conferences. The top features include: multiple homepage layout variations with unlimited possibilities, event management functionality to create and manage events, speakers pages, events calendar, sell tickets with WooCommerce and Event Ticket Plus, Showcase plugin included, and much more. 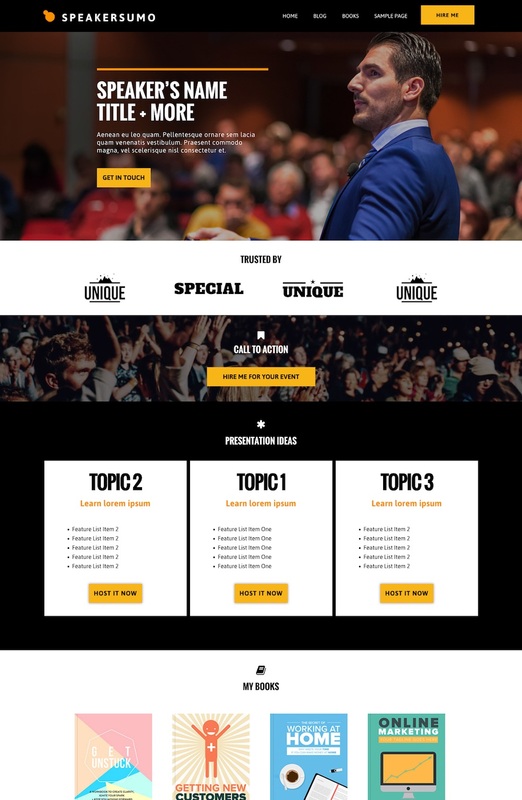 SpeakerSumo is a WordPress theme designed for speakers and events. The premium theme allows you to showcase your profile and easily accept bookings for events or speaking engagements. It has a modern and flexible design and includes the features and functionality you need. It allows you to showcase your speaking topics, your books and publications, and blog posts. You can display your availability and events you will be attending. It has booking functionality and you also display your future and past events and more. 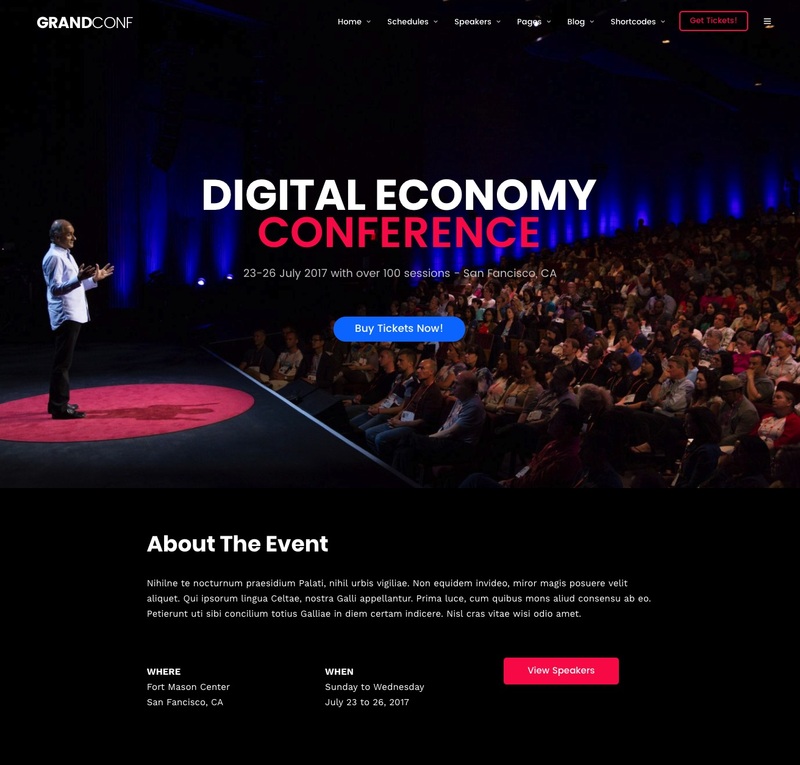 Grand Conference is a comprehensive event template for WordPress. It is highly customizable and includes all the features you need in a website for conferences, events, seminars etc. 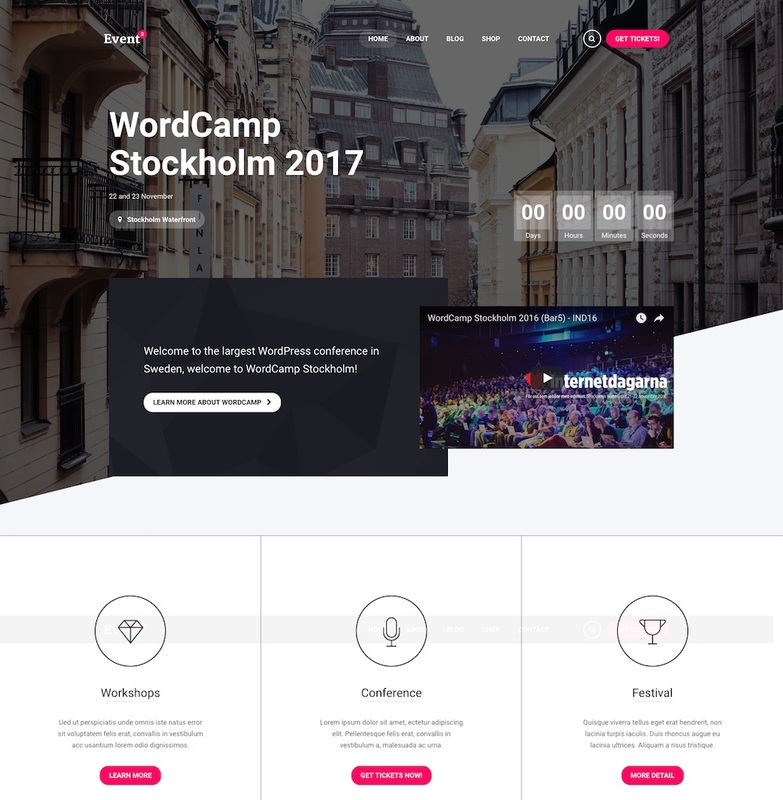 It comes with 30+ predesigned pages for conference and event web sites including sessions, schedule day, speakers, tickets table and many more. The key features include: filterable session topics, conference sessions by days, 3 schedule layouts, location and venue, speaker and info pages, various booking options and much more. 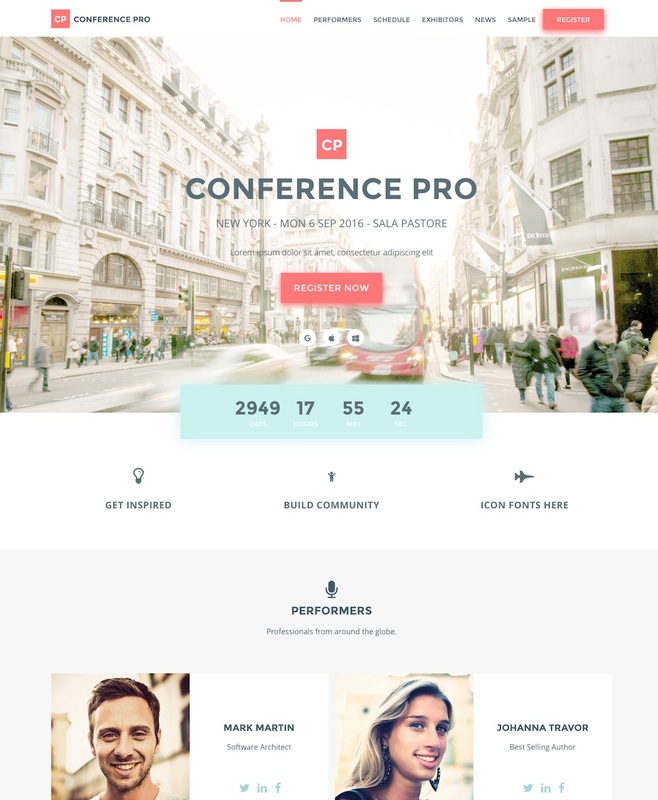 Conference Pro is a flexible and fantastic looking conference and event WordPress theme. The premium theme from ShowThemes has a modern and professional design, is easy to use with drag and drop setup, and comes with all the features and functionality you need for a conference website. Some of the key features include: one click Facebook and Eventbrite import, flexible event composer (drag and drop elements to create pages the way you want), sell tickets (integrates with WooCommerce, EventEspresso, Gravity Forms, Eventbrite, etouches, Tickettailor, Xing Events and more), advanced session and schedule management, countdown timer, social media integration, speakers and sponsors management, easy maps and POI’s, blog section, fully mobile responsive and more. 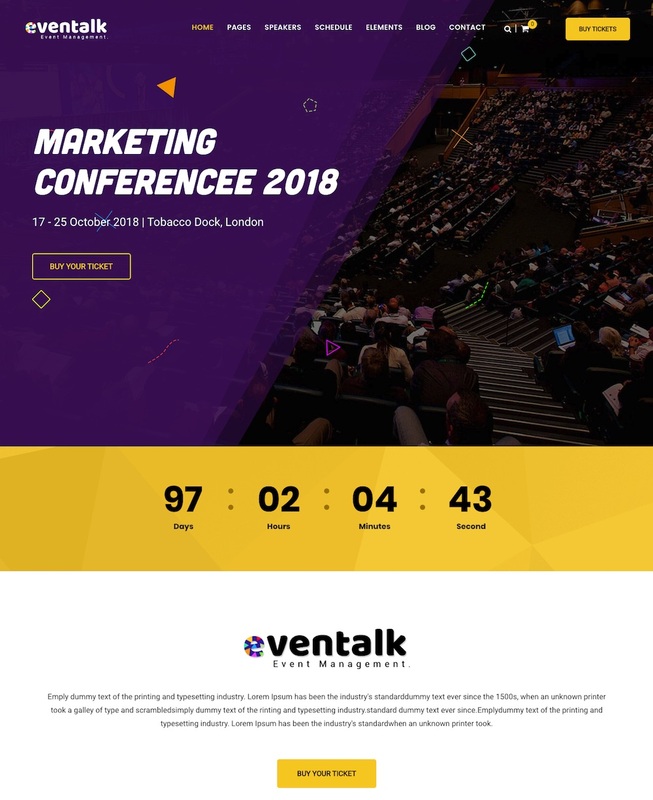 EventTalk is a WordPress event and conference theme created for all kinds of conference and events. It is ideal for both event management companies as well as individual events and comes with the required features and page layouts for events, meetups, and conferences. Features include: 5 homepage layouts, 5 single page website layouts, 3 speaker layouts, 6 event schedule layouts, drag and drop page builder, lots of customization options and more. 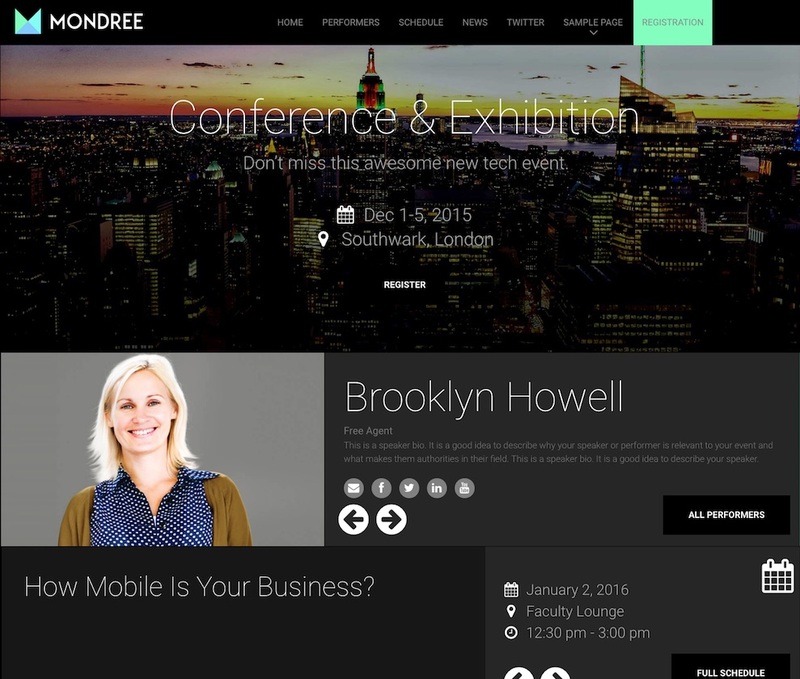 Mondree is a powerful and professional all-in-one event management WordPress theme. The premium theme from ShowThemes has a modern, mobile first responsive design and lots of great features and functionality that let you to easily and quickly create a website for any type of event. You could use the theme for conferences, seminars, workshops, annual meetings, festivals, club nights, exhibitions, or anything else. The Mondree theme has its own custom ‘Event Composer’ content builder. The Event Composer lets you quickly drag and drop elements (such as speakers, schedule, social media, ticket sales etc.) to build your pages the way you want. You can also customize colors, fonts, and other settings to create your own unique event website. Some of the other key features of the theme include: advanced event management (manage speakers, sessions, sponsors, tickets etc), social media integration, countdown timer, one-click demo installation, ticket sales (works with Eventbrite, EventEspresso, Xing Events, etouches, Ticket tailor etc), fully mobile responsive, easy maps and POIs, media and gallery display, blog section, image or video slider on the homepage, integration with quality plugins (Woocommerce, Gravity Forms, EventEspresso, TicketTailor, Eventbrite, Etouches etc), and more. WellExpo is a multipurpose conference and event WordPress theme with a modern and versatile design. It could be used for and type of conference, business forum, tech summit, music event, medical conference, women’s panel, design conference, coming soon page, and more. It includes professional schedule and timetable layouts, ticket selling and payment options, speaker pages, venue info, support and FAQ, registration and more. 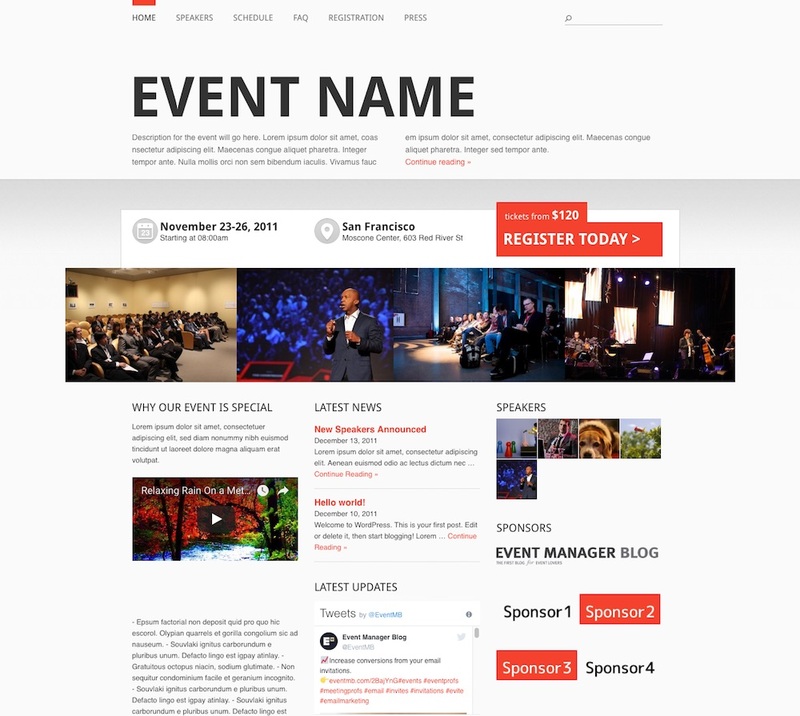 DW Events is a conference and events WordPress theme designed for event managers. The premium theme from Design Wall allows you to easily setup a professional events site with the functionality you need. It features a nice schedule, beautiful speaker details, easy to find Google map location, multiple custom pages, themed color. The theme is ideal for any type of event, conference, festival, congress, big party or other events. 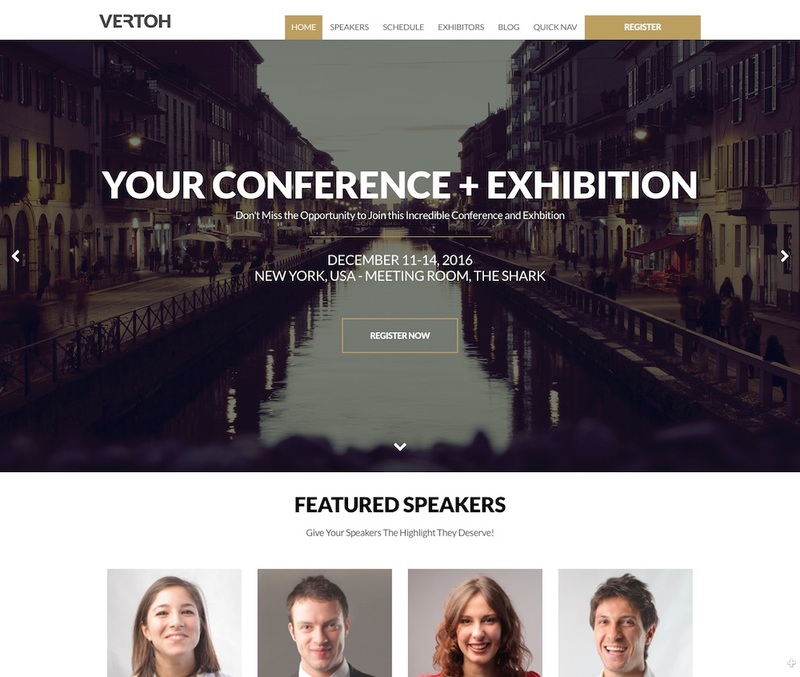 Vertoh is a professional conference and event WordPress theme from Show Themes. The premium theme is perfect for all sorts of conferences and events combining a stunning modern design with advanced event features. 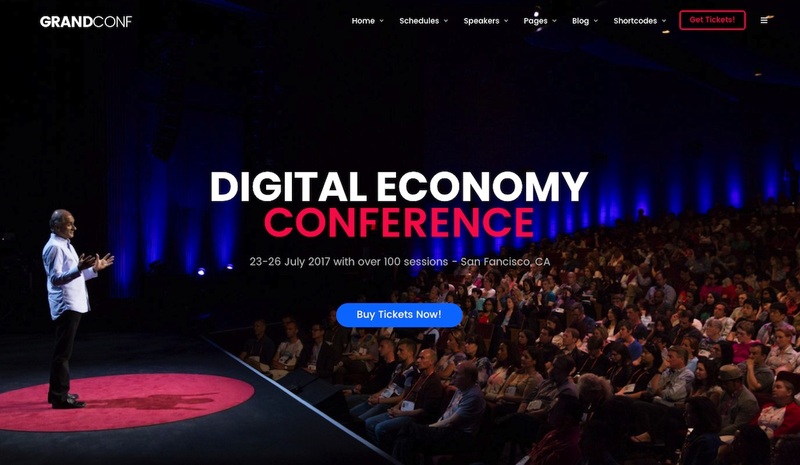 The homepage features a nice background image header with your conference or event name and important details overlayed. 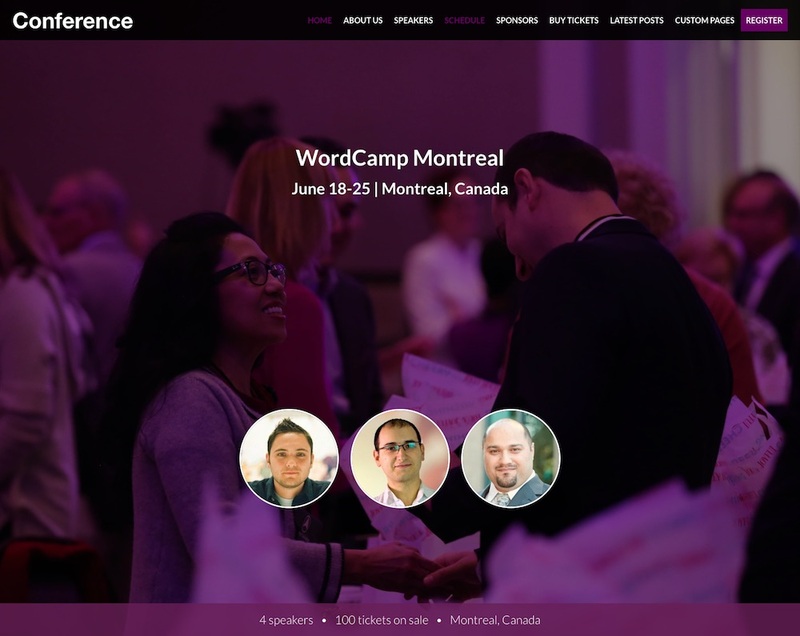 Further down the page you can display all the important information about your event such as: the featured speakers and sessions, highlighted exhibitors, ticket options, call to action and registration, sponsors, maps, news and more. You can add and remove sections to fit your conference / exhibition style. 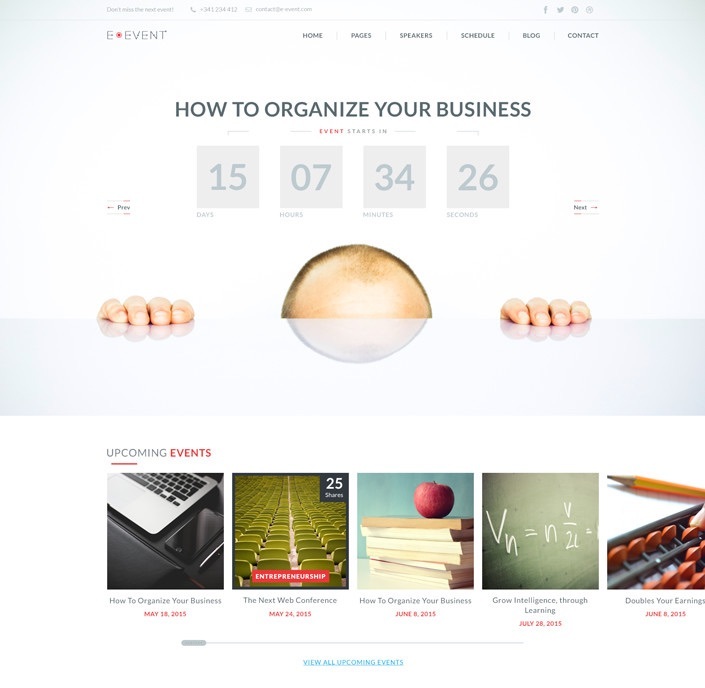 The Vertoh theme includes all the features and event management functionality you need for an event website. Some of the key features include: speaker management (list all the details about speakers or performers), exhibitors management (extensive profiles with key information about their services that people can access, filter and search in a clean design), advanced schedule (quickly show key information such as Location, Time, Track and Performers), offer multiple ticket options, countdown timer, social integration (Twitter, Facebook, Instagram), registration (just drop an Eventbrite, Event Espresso or Xing Events ticket widget code in), WooCommerce support (sell tickets with WooCommerce), easy maps and POIs, a blog section and more. Design wise the theme is very flexible with 4 header options, 15 pre-set color combinations and includes some nice parallax effects. Its also mobile friendly with a responsive layout ensuring it automatically adapts to fit any screen size to look great on all mobile phones and tablets. 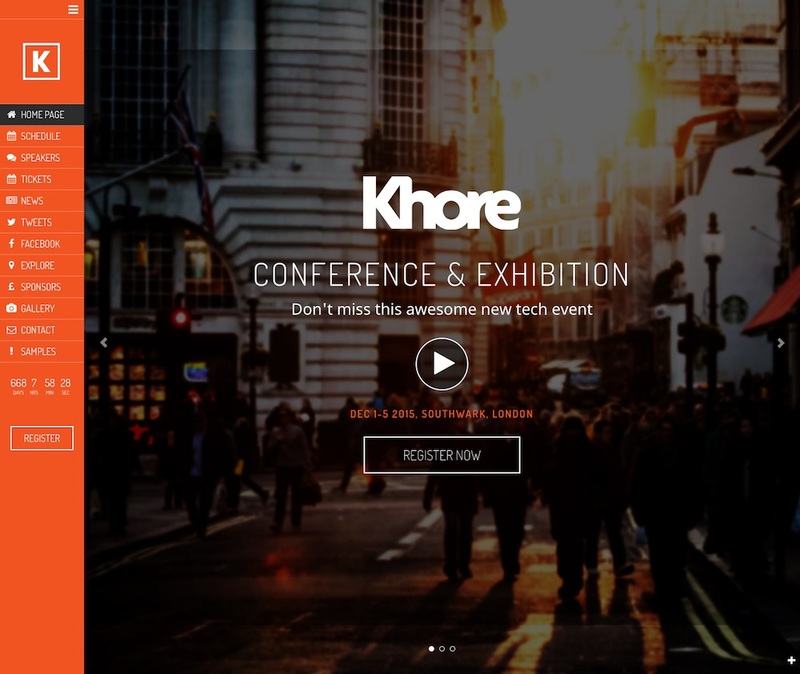 Khore is a flexible and professional conference and event WordPress theme. The premium theme from Show Themes has a mobile first responsive design and advanced event management features to make it easy to build a great looking website for your event, conference, workshop, training session, or exhibition. Some of the key features include: event composer (drag and drop items and build your pages as you want them), advanced event management functionality (schedule and session management, countdown timer, social media displays etc), WooCommerce support to sell tickets and accept payments, 8 language translations, works with Eventbrite, EventEspresso, Xing Events, etouches, Ticket tailor, easy maps and POI’s, blog, social media integration, and more. 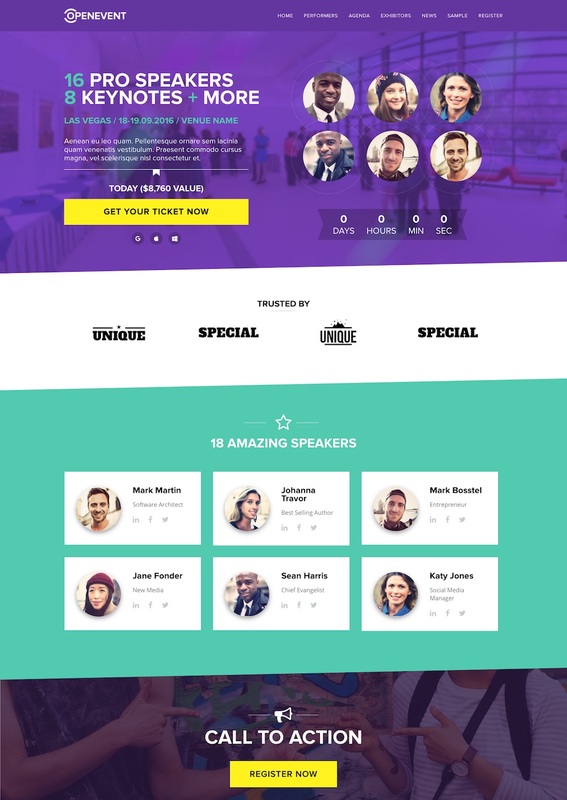 Tyler is a powerful premium event WordPress theme with advanced event planning features that lets you easily create a professional website for a conference, annual event, large meeting, workshop, seminar, or any other type of event. The premium theme from ShowThemes combines a fresh and modern design with powerful event specific features so you can attract attendees with a professional website that sells more tickets. Some of the key event features included in the theme are: dedicated speaker profile pages, advanced schedule and agenda management (create multiple tracks, multiple locations and concurrent sessions, filter by track, location or day etc. ), registration with Eventbrite and EventEspresso integration, social media and Twitter wall, countdown timer, Facebook integration, Maps and POIs, blog section, 15 colour schemes, a mobile friendly responsive design and more. 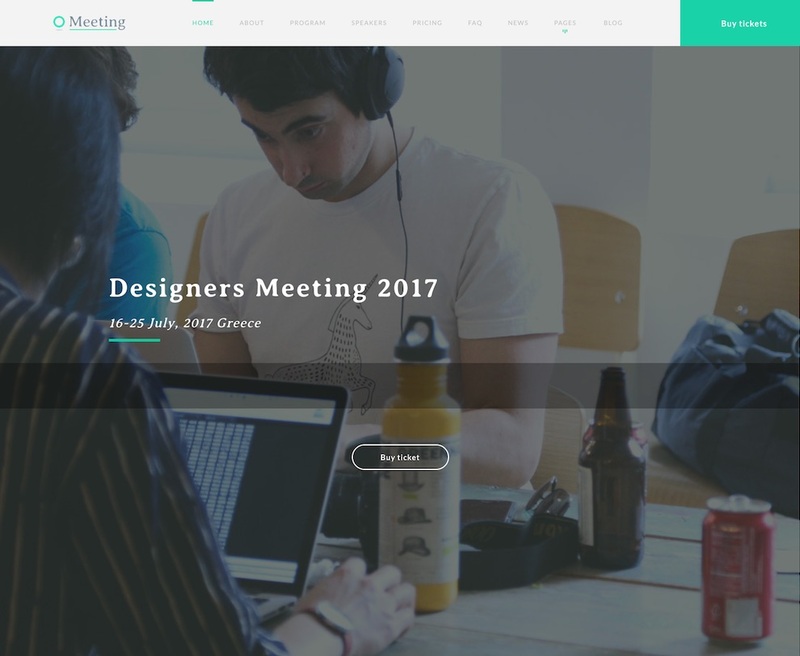 Meeting is a single page event WordPress theme for any type of event, conference, workshop, meet up, summit, meeting or other functions. The premium theme from Tesla Themes has a modern, versatile and mobile responsive design and comes with a lot of useful features to make it easy to set up and run your event page. Some of the key features include: one page dynamic menu, Google maps integration, visual composer, event countdown, Tickera plugin integration, subscribe form, Twitter / Instagram feed, theme options and more. 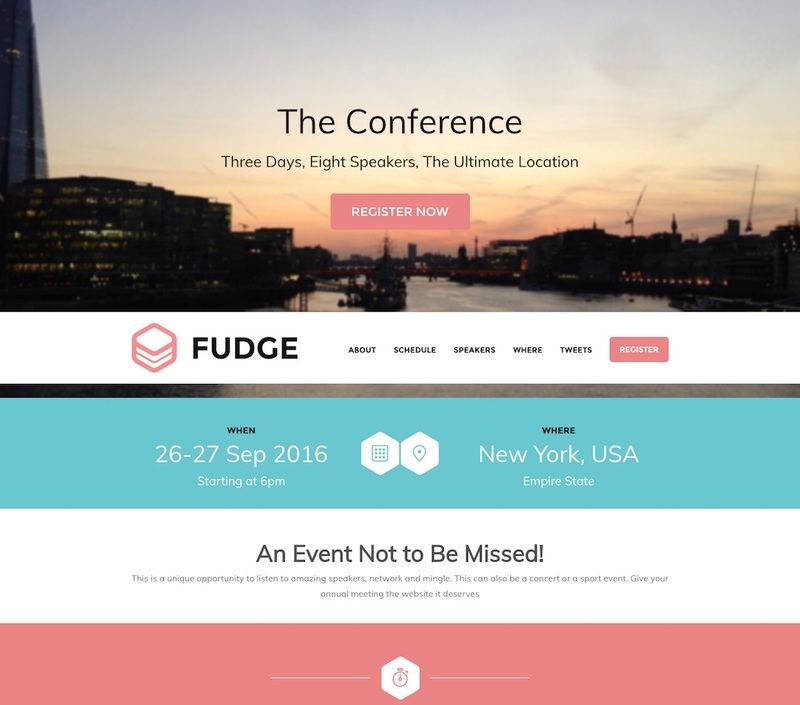 The Fudge theme is a professional and feature rich, mobile ready single page conference WordPress theme. 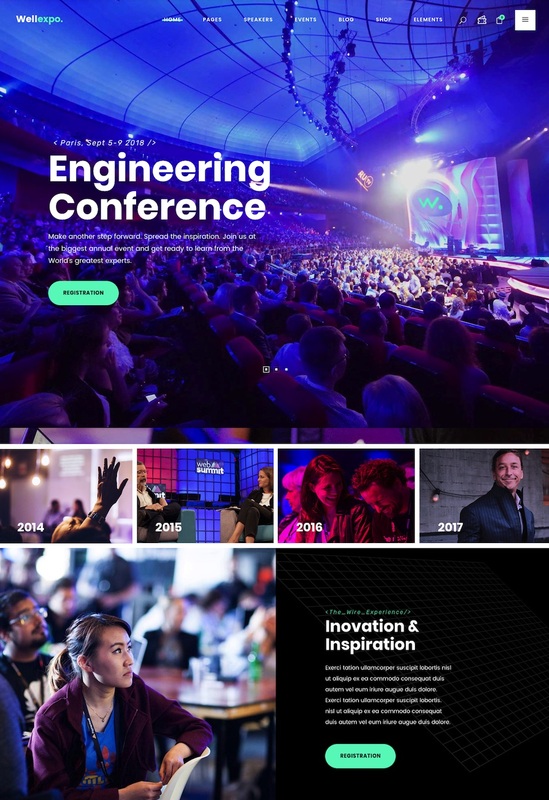 The premium theme from ShowThemes lets you display all the information about your conference or event in a comprehensive and stylish single page website. It’s a powerful mix of advanced event features and a funky look for any type of conference, event, meet-up, work shop, meeting, annual event, festival, Word Camp, reunion or other event. The theme is mobile ready with a responsive design and is completely widgetized so you can manage every aspect of the website by simply dragging and dropping widgets. It packs a lot of other great features including: advanced schedule and performer management (multiple tracks, locations and concurrent sessions, speaker profiles social media links etc), Facebook integration with RSVP, easy registration options (Eventbrite or Amiando), countdown timer, Twitter hashtag wall, Maps and POIs, section for sponsors, a blog section, 10 pre-set colour schemes and more. Event is an events management WordPress theme designed for conferences, events, meetups, exhibitions, congresses and other functions. The premium theme from WPLOOK has a modern and unique design that is fully responsive and mobile friendly. Some of the key features include: schedule section, speakers profile page, gallery, sponsors section, options to sell tickets, display all the event information and location, unlimited colour schemes, 12 custom widgets, 8 custom post types, video background, custom header image, built with Bootstrap and HTML5, theme options and more. 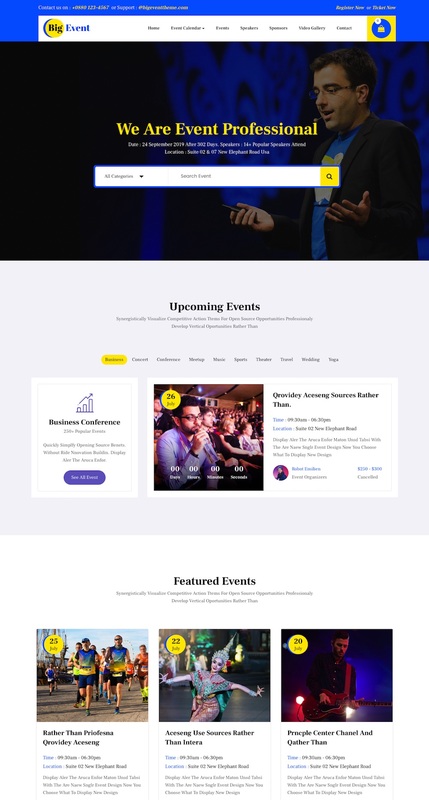 The Event Manager Theme is a responsive premium WordPress theme with a clean and modern design built specifically for conference and event organizers. It includes the features you need in a modern event website including: custom templates for speakers and schedule pages and custom dashboards to easily add the information, logo uploader, social media integration, photo slider, sponsors section, and seamless integration with Eventbrite Ticketing. The theme is also 100% responsive so it’s mobile ready and will adapt to display nicely on all screen sizes and devices. Januas is an advanced events portal WordPress theme that offers multiple events management functionality. The premium theme is perfect for conferences, venues, associations and organizations that need a website to display multiple in-depth event pages for conferences, events, training sessions, workshops, congresses etc. The theme comes with advanced schedule and speaker’s management. You have rich speaker profiles and you are able to specify multiple tracks, multiple locations and concurrent sessions. It has full integration with Eventbrite so you can just drop an Eventbrite ticket widget code in the dashboard to easily manage registrations. Other features include 6 colour schemes, photo and video display, maps, advanced search and filter options, social media integration, watermarks for events that are ended, sold out etc, and more. The theme is also mobile ready with a responsive design so it accessible on all mobile devices such as iPhones, iPads and Android phones. 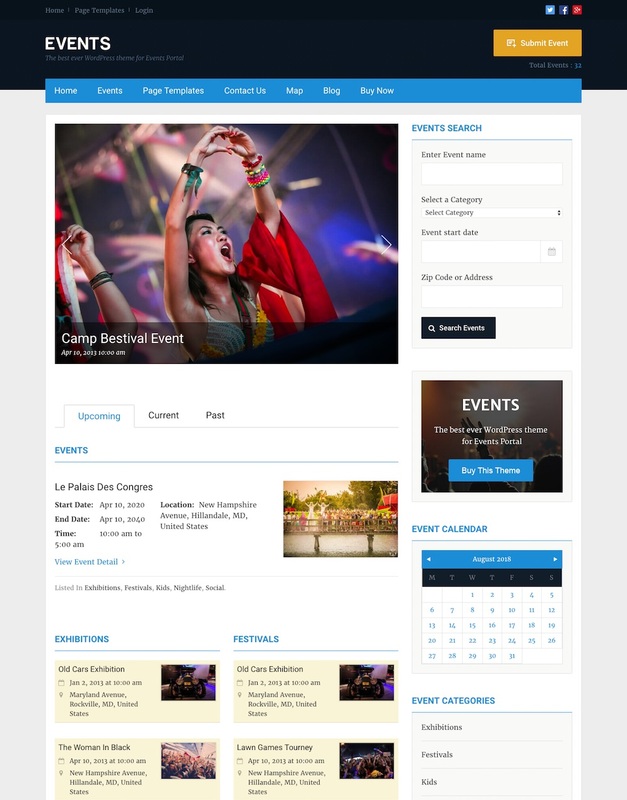 The Events theme from Templatic is a WordPress theme designed specifically for building an events portal website. The theme can be used to create a professional looking website to feature and promote events in your city, town or region. 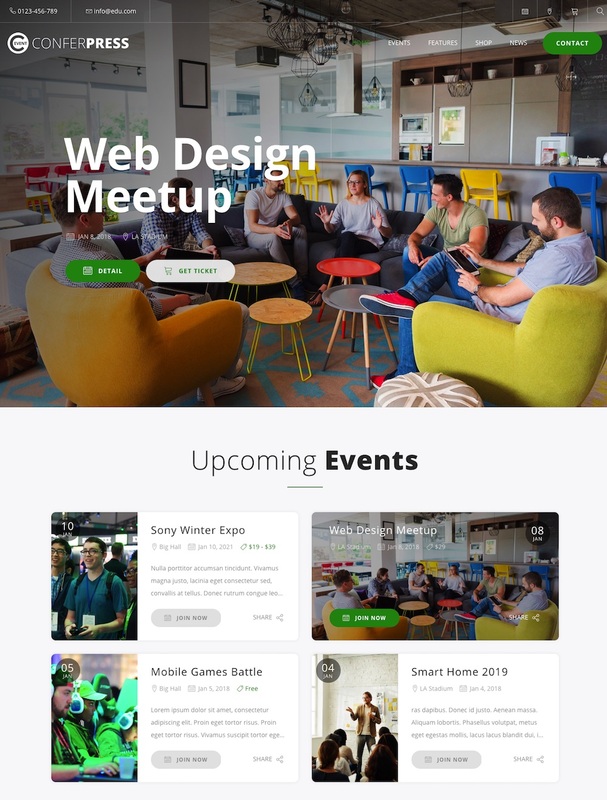 The theme has custom event listings and event details pages, featured event section, a customisable homepage, recurring events functionality, Google maps and Facebook integration, RSVP options and monetization options. 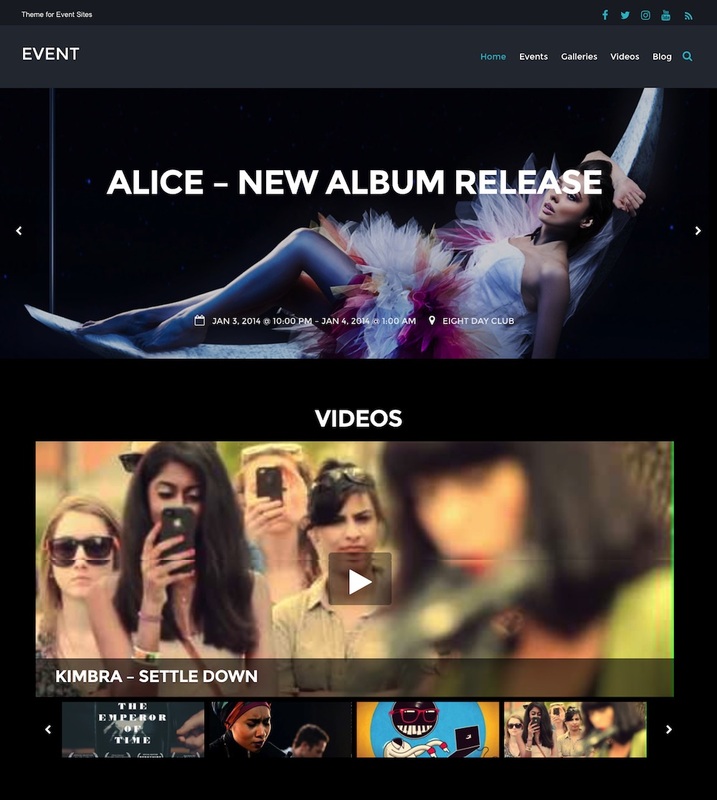 The theme comes with 4 colour schemes choices and has a mobile responsive design so people can access it on everything from smartphones to desktop computers. Event is a premium events WordPress theme from Themify built for music, events, entertainment, bands, nightclubs, restaurants, bars and more. The Event theme has a bold, fluid and mobile responsive design with some nice parallax scrolling and animation effects so your website will really stand out. The theme allows you to showcase upcoming and past events, present photos in beautiful galleries and display videos from any video website. Some of the other key features include: Themify Builder (for unlimited layout possibilities via drag and drop modules), an Event Post Type (with date and time information, options to include a map of the venue, location of the venue, and a link to buy tickets), Gallery Post Type (slider and fluid masonry 4,3 and 2 column galleries), a Video Post Type, custom widgets and shortcodes, Google fonts, WooCommerce support, styling panel (to style anything from fonts, colours, backgrounds etc. ), custom post stats icons and share information and much more. 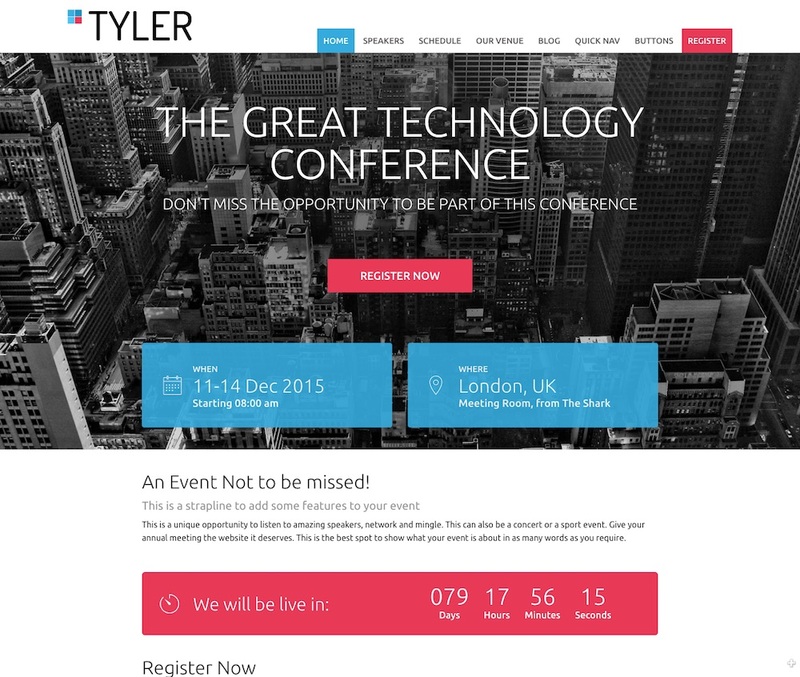 E-Event is a fresh and modern WordPress theme designed for event and conference websites. The premium theme from Tesla Themes is designed with all the latest trends and techniques to make your website stand out and includes the functionality you need. The theme has a custom homepage design where you can display all the important information about your event. It features an upcoming events carousel, counter till the next event, filterable events, two schedule layouts, several pricing layouts, speakers and events schedule, and partner’s section. The theme is built with HTML5 and CSS3 is optimized for speed and is mobile friendly with a responsive layout.